PRESIDENT BUSH MEETS WITH NICK CALIO, MITCH DANIELS, KARL ROVE, LEWIS LIBBY, DAN BARTLETT, JOSH BOLTEN AND ANDY CARD. 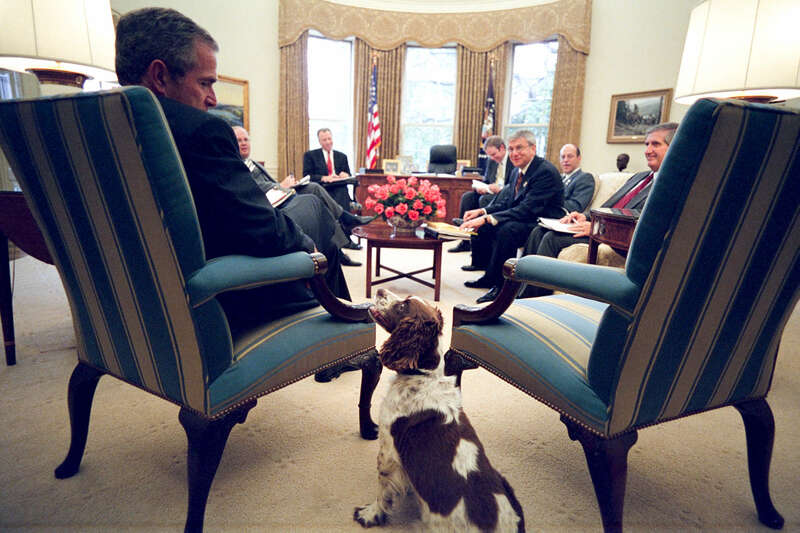 THE PRESIDENT PETS SPOT DURING THE MEETING. ARI FLEISCHER TALKS WITH CALIO AND DANIELS IN THE OUTER OVAL OFFICE PRIOR TO THE MEETING. CALIO TALKS ALONE WITH CARD.